Daniel Kahikina Akaka was a Democratic member of the United States Senate, representing Hawaii. Akaka was born on September 11, 1924 in Honolulu, Hawaii. He received his Bachelor of Education, Professional Certificate in Secondary Education, Professional Certificate in School Administration, and Master of Education from the University of Hawaii. He served in the Military during World War II in the U.S. Army Corps of Engineers (including service on Saipan and Tinian) from 1945 through 1947. Akaka married Millie, with whom he had four sons and a daughter. They now have 14 grandchildren and 10 great-grandchildren. The Council for a Livable World, founded in 1962 by long-time socialist activist and alleged Soviet agent, Leo Szilard, is a non-profit advocacy organization that seeks to "reduce the danger of nuclear weapons and increase national security", primarily through supporting progressive, congressional candidates who support their policies. The Council supported Daniel Kahikina Akaka in his successful Senate run as candidate for Hawaii. 1996: Committee of 100 Sixth Annual Conference: Washington, DC. Conference participants included Senators Daniel Akaka, John Kerry, and Sam Nunn, U.S. Ambassador James Sasser, Representatives Doris Matsui, Patsy Mink, and Chinese Ambassador Li Daoyu. Highlight of the Conference revolved around the Committee’s background paper, “Seeking Common Ground While Respecting Differences: A Win-Win Strategy for U.S.-China Relations,” which was distributed to congressional, government, business, and academic leaders. 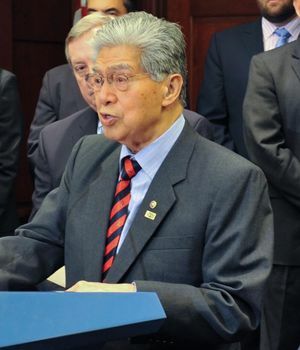 In 2012, Daniel Kahikina Akaka was listed as member the Executive Board of the Congressional Asian Pacific American Caucus. The Hawaii Alliance for Retired Americans’s (HARA’s) 4th Biennial Convention was held in Honolulu January 2012, with about seventy delegates and guests attending. Three members of Hawaii’s congressional delegation addressed the convention--U.S. Senator Daniel Akaka (D), whom HARA presented with their Shining Light Award for his 35 years of distinguished service in Congress; Rep. Mazie Hirono (D); and Rep. Colleen Hanabusa (D). Conference attendees also heard from Richard Fiesta, Director of the national Alliance’s Department of Government and Political Affairs, and several other well-received speakers. The delegates elected Justin Wong as the new HARA President. The new Vice President is Elmer Yuen; Jackie Foil was reelected Secretary; and Phyllis Hiramatsu was reelected Treasurer. Chairman of the Subcommittee on Oversight of Government Management, the Federal Workforce and the District of Columbia. This page was last modified on 23 March 2018, at 22:30.